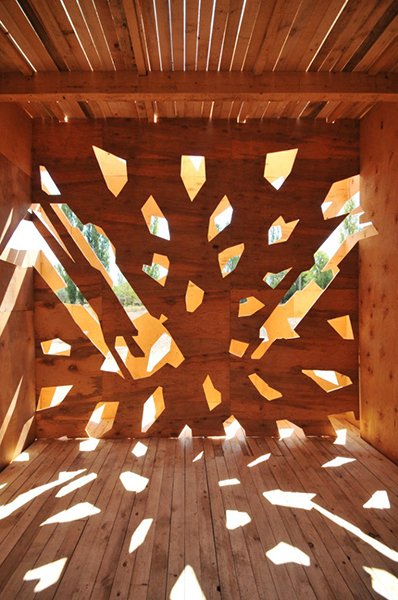 The light cube is an installation for a festival “Catastrophe” that took place near Odessa in Summer 2012. The topic of the festival was connected with the apocalypse predictions of that year. The Cube itself looks like as if it was hit by a meteor rain at judgment day. But the most interesting things are happening inside. Main role here plays the sun, which creates a mini-performance with light during a day. Sunlight penetrates through many quaint holes. During the day it forms sunbeams of definite shape on the floor. Thus there ere appearing various pictures, which tells the story to the viewer about the catastrophe and the man. The picture effect occurs because of using of double skin facade. Both skins allow sunlight to pass through the wall only at the proper time. At the timespan of the picture changing one skin overlaps the other and makes the light pour only where it is needed drawing certain images with a story.